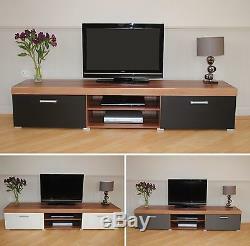 SYDNEY Large 2 Door TV Cabinet - Walnut Effect with Black / White / Graphite Fronts - NEW. 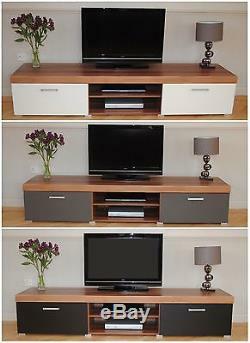 This MASSIVE TV cabinet is from our Sydney range, with a walnut effect carcass and contrasting doors. 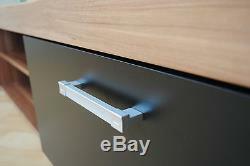 This unit is 2 metres long with 2 drop down doors, finished with plastic silver coloured handles and feet. We also have a smaller 140cm model available. Available in three colour fronts: Black, White, or Graphite. 2 Additional storage shelves in the centre. Due to this size I think you could put a TV of any size on it without any trouble! (Please note this unit is not suitable for fish tanks). 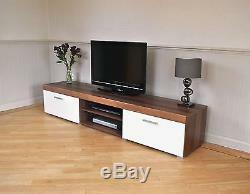 O hide away the DVD player, Sky Box, sound system, games console. Please note as per photos that the white is an off-white rather than a bright/brilliant white. 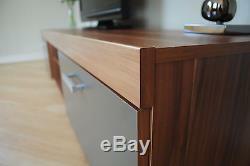 The walnut effect is a medium-brown wood effect. This is a solid and well built piece of furniture. 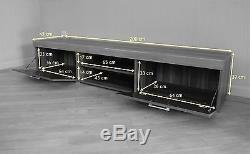 Please note the measurements - this is a large piece of furniture! Supplied flat pack - home assembly required (2 people recommended). 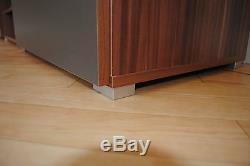 Please see my other items! 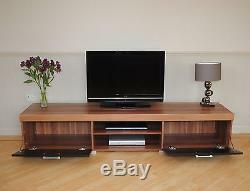 The item "2 Metre Large 2 Door TV Cabinet Plasma Bench Stand Unit Black Walnut Grey White" is in sale since Thursday, April 25, 2013. 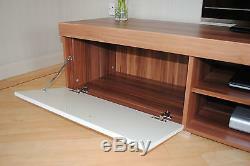 This item is in the category "Home, Furniture & DIY\Furniture\TV & Entertainment Stands". The seller is "drp-trading" and is located in Market Rasen. This item can be shipped to United Kingdom.